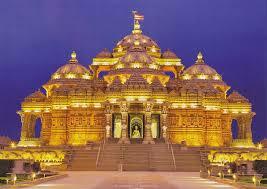 The main attraction of the complex is the Akshardham Mandir. It rises 141-foot high, spans 316-foot wide, and extends 356-foot long. It is intricately carved with flora, fauna, dancers, musicians, and deities. Designed in accordance with the standards of Maharishi Vastu Architecture, it features a blend of architectural styles across India. 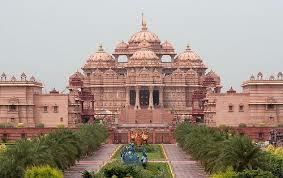 It is entirely constructed from Rajasthani pink sandstone and Italian Carrara marble. 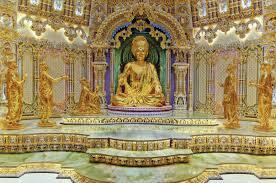 Based on "Shilpa shastras" on maximum temple life span, it makes no use of ferrous metal. 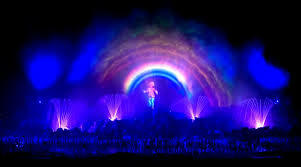 Thus, it has no support from steel or concrete. 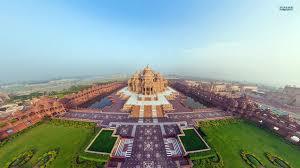 The mandir also consists of 234 ornately carved pillars, nine domes, and 20,000 murtis of sadhus, devotees, and acharyas. 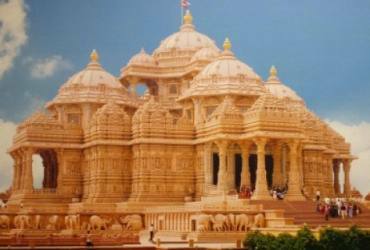 The mandir features the Gajendra Pith at its base, a plinth paying tribute to the elephant for its importance in Hindu culture and India's history. It contains 148 life sized elephants in total weighing a total of 3000 tons. Under the temple's central dome lies the 11-foot high murti of Swaminarayan seated in abhayamudra to whom the temple is dedicated. Swaminarayan is surrounded by images of the faith's lineage of Gurus depicted either in a devotional posture or in a posture of service. Each murti is made of paanch dhaatu or five metals in accordance to Hindu tradition. 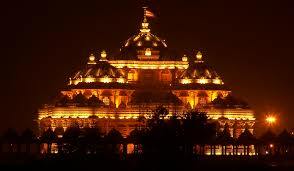 The temple also houses the murtis of Sita Ram, Radha Krishna, Shiv Parvati, and Lakshmi Narayan.